Discussion in 'Anything goes' started by Webster, Jun 25, 2011. Since we haven't had one in a while (that I could find), just had two great and one very good beers the past couple of days that I had never tasted before. Sixpoint Bengali Tiger -- an IPA from a brewery in Brooklyn. Fantastic. Have to see if there is any other beers available from them. Trappistes Rochefort 10 -- a beer that is super complex. Like a good wine. Abita Satsuma Harvest Wit -- a Belgian wit style with a good citrus and spice tastes. A nice summer beer. Anyone else have something interesting recently? I haven't tried anything new lately. Has anyone tried one of these new black IPAs? I would like to but am afraid I won't be able to go back to regular IPA. I'd just like to say, I've never met a beer I didn't like. I've been making my own through Williams Brewing lately. Lion Stout was a treat a while back. I take it you've never had Alexander Keith's IPA. Let it never be said the French lack the essentials to put out a strong beer. Just about everything from Sixpoint is awesome. I had the Blue Point Summer Ale tonight and it was fantastic. 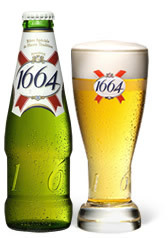 As for Kronenbourg, it's a solid beer that goes down easily. Them's fightin' words in Canuckistan! Big fan of this too, terrific stuff. By the by, was in the beer store yesterday and saw that Labatt's has now brought Rolling Rock to our shelves. This isn't a good thing is it?